I am a Gluten Free Mama. I am not a doctor, scientist, nutritionist or a medical professional of any kind. I am a busy mama trying to live a gluten-free life the best I can. The information I share on this website is from my own personal research and my personal experiences. My hope is that by sharing my gluten-free journey, others might be helped with theirs. Gluten is a protein found in wheat, rye, and barley. It is also in most oats, not because of the oat itself, but because of the way it is processed. To get a more technical explanation, click here. How does gluten affect the body? If you are gluten intolerant or have celiac disease your body thinks gluten is a foreign substance. So, when gluten reaches your stomach, it panics. Your stomach reacts by sending antibodies to attack the unknown substance. This causes your immune system to become hyper-alert with auto-immune components. This can cause your body to attack its own tissue in the small intestine. 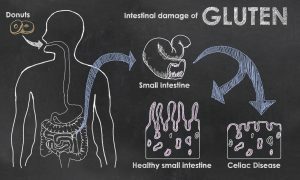 When your immune system reacts to the gluten, it damages the villi (small “fingers” in your small intestine that absorb nutrients from your food), so they cannot properly absorb the nutrients from the food you are eating. Common symptoms of Celiac disease and gluten intolerance are abdominal pain, bloating, cramping, weight gain or loss, constipation, diarrhea and alternating between constipation and diarrhea. Approximately 1 in 100 people have an autoimmune response to gluten and that is known as Celiac Disease. Click on this link for more information about celiac disease. According to the Center for Celiac Research, the University of Maryland, an additional 6% (18 million people) may be classified with non-celiac gluten sensitivity or “gluten intolerance”. Unfortunately, there is no cure for gluten intolerance or celiac disease. The only thing you can do is avoid gluten with a gluten-free diet. Most people start to feel better within days of removing gluten from their diets if they can’t tolerate it. Testing can help identify celiac disease or gluten sensitivity. You can be medically tested and you can do your own elimination test as well. Other than being medically tested you can also do a food elimination diet to see if gluten really is a problem for you. You will need to eliminate all gluten from your diet for a short period of time (2 to 4 weeks). I personally recommend 30 days of being totally gluten-free. For this test to work, you must eliminate 100 percent of the gluten from your diet. After 30 days of this elimination process, try eating gluten again to see how your body reacts. An elimination test will teach you how gluten effects on your body. 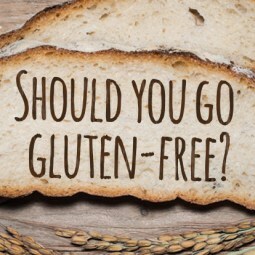 You will need to get rid of the following foods: gluten (barley, rye, and wheat)–see www.celiac.com for a complete list of foods that contain gluten, as well as often surprising and hidden sources of gluten. There are lots of hidden sources of gluten in your diet (soup, mixes, salad dressings, sauces, alcohol, certain vitamins, medications, and even Play-Doh.) You will have to look at every label. You can read about my personal journey on how I realized I have non-celiac gluten sensitivity (also know n as gluten intolerance) here. Staying away from gluten is not as simple as it seems. Being gluten-free is not just staying away from bread and pasta. Unfortunately, gluten is in many foods and products you would not immediately think it would be in (candy, yogurt, dressings, sauces, processed meats, canned soup, soy sauce, nutritional supplements, and medicine). You will need to look at all labels. A lot of companies list allergens in bold lettering on their labels, but not all of them do. Gluten ingredients are not always listed as wheat. For example, some other ways gluten is listed in ingredients is as malt and soy sauce (regular soy sauce is made from wheat). For a good list of safe products click here and unsafe products click here. The point is to be aware, read and educate yourself. Do not assume that the food you are about to eat is safe. When in doubt, check it out! Going gluten-free can be totally overwhelming at first. I promise that it does get easier and that it is so worth it! Try and focus on what you can eat and not what you can’t eat. There is a whole big beautiful world of naturally gluten-free foods out there! Fruits, vegetables, beans, rice, unprocessed meats, dairy, most cheeses, fish, and seafood. There are also really great gluten-free alternatives for pasta, bread, cookies, and cakes. There are a ton of great gluten-free recipes too. The gluten-free community is really great on sharing resources. Have a plan when you go grocery shopping. Make lists, find good recipes, know what’s on the not safe list and check EVERY label. Look at it as a new adventure. 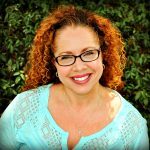 Check out my favorite recipes, brands, restaurants and what are my gluten-free lifestyle must-haves.